The Regional Student Organization (OMDA) of the Keluarga Kudus Bogor Menara Kota (KKB-MK) held a nutritional consultation and distribution of free milk to the Kudus community at the Kudus City Square, last month (28/1). KKB MK is a organization of Bogor Agricultural University (IPB) students coming from Kudus. This free nutrition consultation was held to commemorate the 58th National Nutrition Day (HGN) which coincided on January 25, 2018 and the peak event of the "Bakti Menara Kota" series. Previously KKB MK started the activities of "Bakti Menara Kota" by holding IPB Goes to School (IGTS) and Campus Expo held in several high schools in Kudus. "This free nutrition consultation is a form of our dedication as a student of IPB to the Kudus community.This event is indeed a first step to get closer to the community because in previous years we only visited several high schools in Kudus so it focused on high school students only, "said Syaiful Anwar as Chief Executive of Bakti Menara Kota. Nutrition consultation and distribution of free milk begun at 06.00 and ended at 10:15 pm. The series of events included opening by the MC, followed by nutrition consultation and milk distribution, entertainment, and closing. 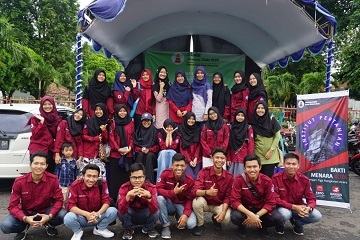 Nutrition consultants who attended the event this time amounted to three people who are S1, S2, and alumni of the Department of Community Nutrition IPB. Despite the cloudy and rainy weather for a few minutes, the free nutrition participants remain enthusiastic, even willing to queue to consult nutrition and health issues to the consultants. According to Romneya, one of the participants from Prambatan village, "This nutritional consultation is very useful and helps the community to improve the diet and nutrition of the people of Kudus, and the distribution of free milk also helps increasing the level of milk consumption of the Indonesian people which is still considered low," Romneya , participants from Prambatan Village. Existing nutrition consultations included weight and height measurements, blood pressure and body fat levels measurements. A total of approximately 100 glasses of milk were distributed free of charge to the people who join this event.